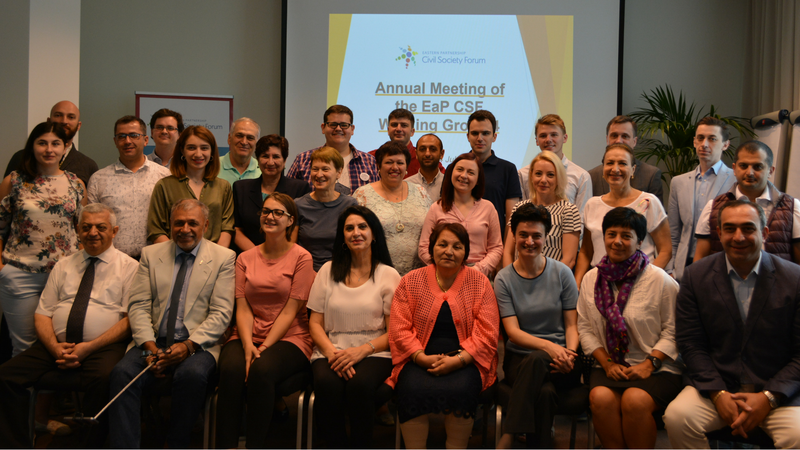 The members of the Working Group 4 “Contacts between people” (WG4) of the Eastern Partnership Civil Society Forum (EaP CSF) gathered in Brussels for their annual meeting on 3-4 July. After two days, they were briefed on the EaP CSF internal reform process, and revised the current WG4 Annual Plans, communication strategies, and the WG4 projects from the 2018 Re-granting scheme. They also had the opportunity to receive trainings on effective messaging and writing successful proposals for grants, and to present messages to the EU stakeholders attending the meeting, Marta Wytrykowska, European External Action Service (EEAS), and Kamila Partyka, DG Education and Culture (DG EAC). 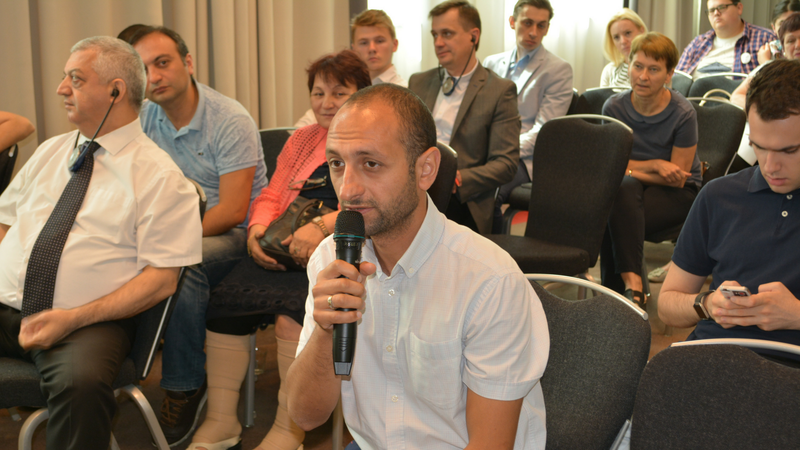 The meeting was opened by the Steering Committee member, Mikalai Kvantaliani, Association “New Group”. While presenting the agenda, he stressed the need to address EU stakeholders and revise the current WG4 Annual Plans, devised during the Annual Assembly in Tallinn. Together with Mr Kvantaliani, Director of the Secretariat, Natalia Yerashevich elaborated on the internal mechanisms of the Forum and its latest internal reform. One of the suggestions was to send a proposal to the experts working on internal reform, asking them to develop a code of conduct in accordance with the Istanbul Principles for CSOs Development Effectiveness. 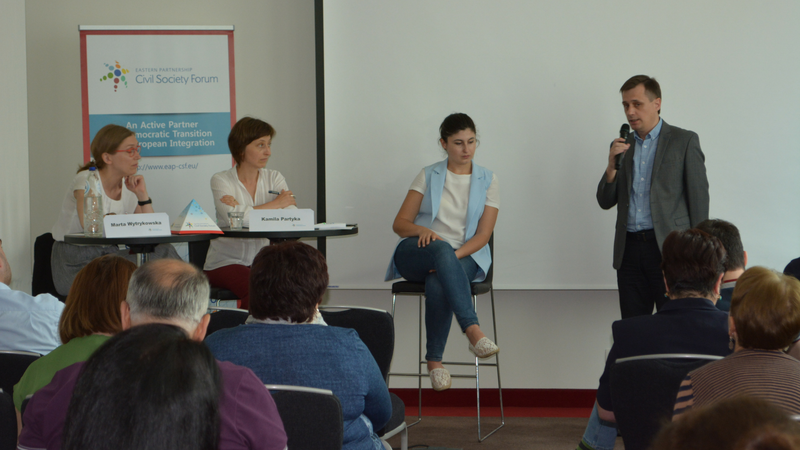 Another contribution came from Mariia Symonova, who shared her experience from a recent Platform 4 meeting, giving six useful tips for those planning to attend similar events as part of Platforms and Panels. What is more, Ms Symonova highlighted the importance of using different communication strategies when addressing civil society and governments. The meeting was also a chance to introduce three projects from the 2018 Re-granting Scheme, presented by Artur Ghazaryan (“Youth for entrepreneurship in rural areas”, Armenia), Hovsep Khurshudyan (“Youth Economic Empowerment through Social Entrepreneurship”, Armenia) and Tatyana Poshevalova (“Creative EaP”, Belarus). On Day 2, members had an opportunity to attend two training sessions, “Fundraising and writing successful project proposals for grants” by Grigor Yeritsyan, Armenian Progressive Youth and “Effective Messaging and how to successfully target EU-specific audience/stakeholders” by Darya Mustafayeva. The objective was to boost members’ communication skills, to allow them to fully engage in official EaP meetings and with their stakeholders. Later meetings were also attended by representatives from EU institutions. Marta Wytrykowska, European External Action Service (EEAS) was interested to hear more about the upcoming EaP Youth Conference in November and programmes for young entrepreneurs. Ms Wytyrkowska was also receptive to the idea of conducting a study on internal migration and displacement, as suggested earlier by Iulia Kharashvili, and incorporating its findings into EEAS reports. Kamila Partyka, DG Education and Culture (DG EAC) introduced some core concepts behind the new Culture and Creativity Programme, focusing on social entrepreneurship. The programme also includes EaP countries, meaning all six countries will need to consider its implementation and questions relating to quality assurance in education. Ms Partyka then turned to civil society and its role in this process, both as a watchdog and partner in discussions.